(Bloomberg Opinion) -- Just as its oil sector looked set to stage a recovery, Libya is heading back towards bloody chaos that puts output and exports at risk. 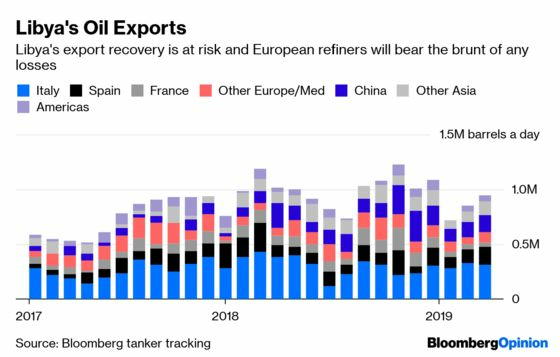 A disruption to supplies from the North African country would hit European refiners and raise oil prices around the world. Libya – one of my Shaky Six OPEC oil producers at risk of unintended output declines – intends to export more oil in April than it has done in almost any month since the ouster of Moammar Qaddafi in 2011. But those plans could fall apart in the face of renewed violence, as the internationally recognized government in Tripoli vows to “cleanse all Libyan cities of the aggressors,” referring to Khalifa Haftar’s self-styled Libyan National Army. The LNA controls the east of the country and the sparsely populated south. Now Haftar has turned his sights on Tripoli. Local militias, battle-hardened and well armed, have vowed not only to stop him, but to wipe out the LNA. International appeals for calm and an end to the fighting have fallen on deaf ears. Oil production facilities are not immediately at risk from the conflict. The country’s biggest oil field, Sharara, is located some 700 kilometers south of Tripoli and most of the others are far to the east. It was shut down in December after guards and armed residents seized it over financial demands, and remained out of operation until March. Production only resumed after the facilities were taken over by Haftar’s LNA in February and then handed back to the National Oil Company. Output is now reported to be close to the field’s 300,000 barrels a day capacity. However, crude from Sharara is exported through the Zawiya terminal, some 50 kilometers west of Tripoli, and any attempt by Haftar’s forces to gain control over the whole of Libya would have to include securing that facility, likely cutting oil flows in the process. Furthermore, any escalation in fighting around Tripoli could still impact output and exports by spurring a repeat of what happened earlier this decade. During the revolution that toppled Qaddafi, production and export infrastructure were spared large scale damage. After he fell, clashes between rival militias damaged vital facilities. Attacks on Ras Lanuf reduced the number of operational storage tanks at the export terminal from 13 to just three, reducing the ability of producers who rely on the facility to export their crude to keep pumping when bad weather closes the port. This time, if fighters get pulled away from the oil installations they are guarding, those facilities would be at greater risk of being overrun by ISIS cells still present in Libya, or by disgruntled local groups. At least there is a substitute for the latter. U.S. shale-derived crude offers a decent match in quality terms for Libya’s light, sweet (low sulfur) grades, and is a much better match than it is for the heavy, sour (high sulfur) cargoes from Iran. But those American barrels are a long way from the Mediterranean and there will be a delay in getting them where they are needed. Though these cargoes offer potential for containing any price increases if North African exports are disrupted, any impact won’t be immediate. Fears that the conflict will spread are already driving them higher. 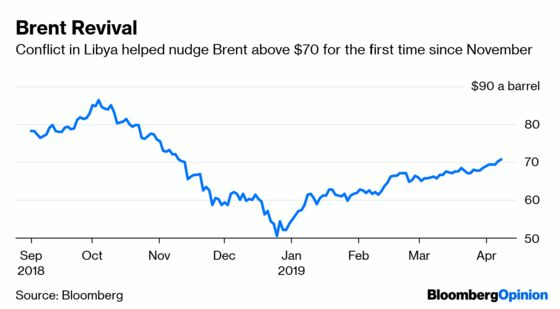 Brent closed above $70 on Friday for the first time since November. Aggression in Libya will continue to add a risk premium to oil prices, and if the fighting starts to reduce exports, could send them soaring.